10 years ago, Amy Winehouse released her Grammy Award winning 2nd and final studio album ‘Back To Black’. Amy was known for her strong vocals and jazzy tone. She was arguably one of the most talented artists of her generation. She died at the age of 27 in 2011, but her legacy still lives on throughout London. I studied at London College of Fashion this past spring semester and since she’s one of my favorite artists, I made it my personal mission to see as many things that were Amy Winehouse related. 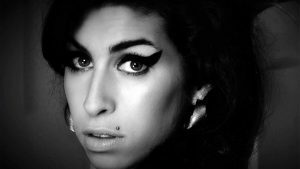 The following are a few of the many places where Amy Winehouse has left her mark. Start your tour off in Camden. Camden was where Amy lived, hung out, and worked (before her rise to fame). Camden offers a wide range of cuisine, markets, and live music venues. It’s known for being a little rough around the edges, but in the best way possible. It is easily one of my favorite spots in London. Here, you can find traces of Amy everywhere. 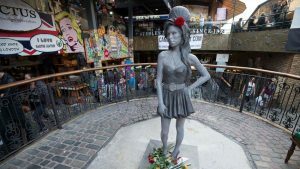 This life-size bronze statue of Amy made its debut in 2014 at the Stables Market in Camden Town. Your next stop doesn’t require you to walk very far. 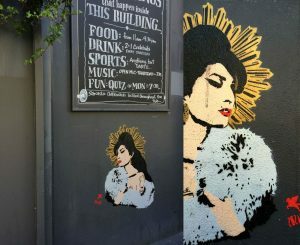 Simply walk up and down some of the side streets in Camden and you’ll find several street art tributes to Amy. This is just one example of many, but it’s one of my favorites. The artist Pegasus titled it ‘Atmosphere’. It can be found on the side of The Earl of Camden Pub. 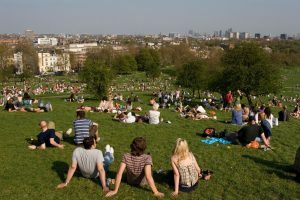 Your next stop on the tour is Primrose Hill. Primrose Hill overlooks London. It’s a pretty good hike to the top, but the views are definitely worth it. From the top of the hill, you can see St. Paul’s Cathedral, the London Eye, and The Shard. Amy Winehouse spent her summers here, frolicking around the park with her boyfriend. Your next and final stop is Abney Park Cemetery. 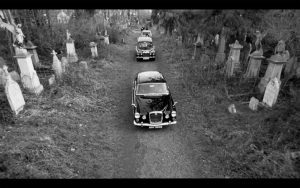 Abney Park Cemetery is where Amy Winehouse filmed her ‘Back to Black’ music video. With 200,000 people buried here, Abney Park Cemetery is one of the ‘Magnificent Seven’ garden cemeteries in London and it is located in Stoke Newington. One of my classes at London College of Fashion included us taking a tour of the cemetery. Our professor instructed us to take the hour to just get lost in the cemetery. It was a bit morbid but oddly quite beautiful at the same time. A definite must-see! And that’s the end of the tour! Now don’t mind me, I’ll just be in my room all day listening to the ‘Back to Black’ album on repeat.